This stucco relief fragment shows a crowned gandharva enclosed by an oval flame-bordered vesica. A gandharva is one of the lowest-ranking devas (non-human inhabitant of the heavenly realms which is characterised by long life, joyous surroundings and blissful states of mind) in Buddhist religion. They can fly through the air and are skilled musicians. The figure kneels on a lotus pedestal and clasps the hands in adoration. The drapery follows the lines of the body with stoles issuing from the sides. The head and the lotus pedestal are lost. 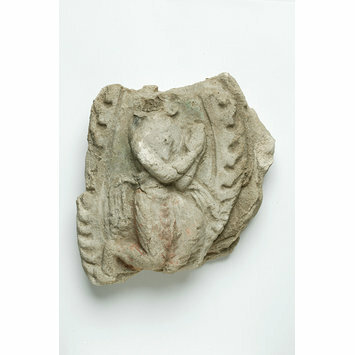 Several almost identical relief fragments were found as they were made from the same mould. They probably served as decoration of the vesica of a colossal Buddha statue which is now lost. It was excavated in one of the Buddhist shrines at the site of Khadalik which lies between Khotan and Keriya on the southern branch of the Silk Road in Xinjiang, China. The Victoria and Albert Museum has more than 70 ceramic fragments and fragments of Buddhist sculptures, as well as around 600 ancient and medieval textiles recovered by Sir Marc Aurel Stein (1862-1943) during his second expedition (1906-8) into Chinese Central Asia, where he once again visited and excavated sites on the southern Silk Road, before moving eastwards to Dunhuang. At Dunhuang, he studied and excavated the Han-dynasty watchtowers to the north of the town, as well as the Mogao cave temples to the southeast, where he acquired material from the Library Cave. From there he moved on to the northern Silk Road, stopping briefly at Turfan sites but not carrying out any excavations. He made a perilous north-south crossing of the Taklamakan desert in order to hasten to Khotan where he excavated more ancient sites, before finishing off his expedition with surveying in the Kunlun Mountains. 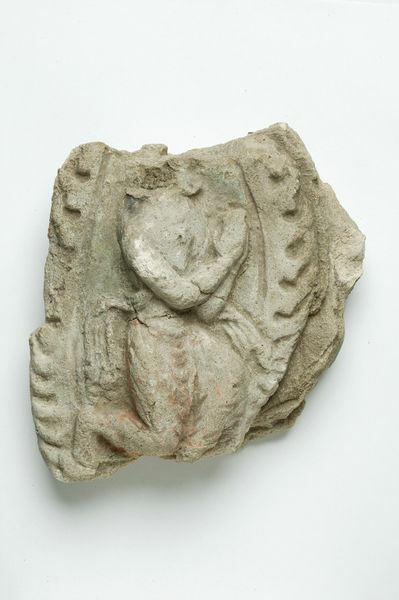 Stucco relief fragment of a crowned gandharva enclosed by an oval flame-bordered vesica. The figure kneels on a lotus pedestal and clasps the hands in adoration. The drapery follows the lines of the body with stoles issuing from the sides. The head and the lotus pedestal are lost. Found in one of the two main shrines at the site of Khadalik. This object does not have its own entry in Aurel Stein's list (Serindia, vol. 1, see References), but was noted under *Kha.i.N.001 which is from the same mould. Khadalik lies between Khotan and Keriya on the southern branch of the Silk Road. Here Stein discovered remains of a number of Buddhist shrines. Inside several temples were elaborate murals depicting Buddhist deities, large statues with traces of gilding, reliefs and painted panels. Large numbers of Buddhist texts were found among the ruins, including pothi, religious books of Indian origin, written in Sanskrit, wooden tablets and sticks covered in Tibetan writing, and fragments of documents deposited as votive offerings. Other votive gifts included numerous small pagodas and moulded Buddha figures. Strings of Tang Dynasty (618-907 AD) copper coins, left as offerings near Buddha statues, were taken by Stein as evidence that the site had been abandoned in the eight century AD. The V&A holds, on loan, from Khadalik, pieces of woven plant fibres, wool felt and twill; and plaster-covered woven fabric, which may have functioned as stucco backing. Fragment of a gandharva, China.